When we published our first interview with Rob Niederman back in 2008, he was focused, if you will, on historically significant and exceedingly rare pre-1900 wood cameras. Most camera collectors don’t usually start at such lofty heights. A more common obsession (for some it’s just a phase) is to collect Kodak cameras. A problem for all camera collectors, 100 years downstream, has always been the lack of information about the things they’re trying to collect. In the case of Kodak, the sheer number of models and variations produced have made both collecting and researching difficult and time-consuming. And so, for the past 18 months, Niederman and a colleague have had Kodak history and cameras in their sights. They’ve tracked down and scanned almost every significant Kodak catalog published from 1886 to 1941. The project started in earnest in early 2010, when Niederman and Milan Zahorcak began scanning 67 Kodak catalogs, primarily from the collection of Charlie Kamerman, whose Kodakcollector.com is a member of our Hall of Fame. Kamerman also helped obtain several other catalogs to fill in the gaps. In all, just over 3,900 pages were scanned generating more than 7,900 original and processed images. 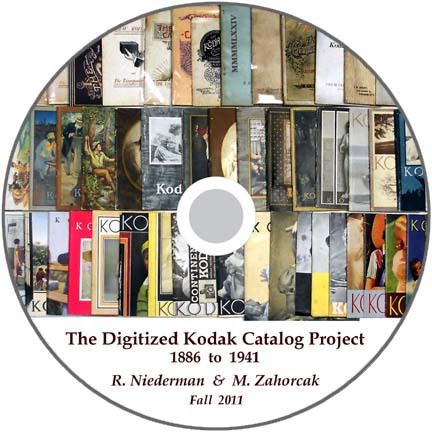 This month, the results of their efforts, The Digitized Kodak Catalog Project, was announced. Because of the scale of the project, downloading all 3,900 pages isn’t a viable option (the 1.5 GB of information they accumulated would take more than seven hours to download with a broadband connection), but it will be readily available as a DVD, nominally priced to cover materials and distribution. 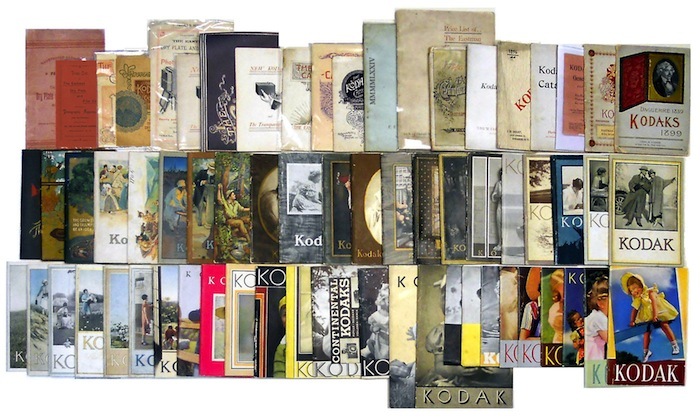 “One of the nice things about collecting Kodak,” continue Niederman and Zahorcak in their backgrounder on the project, “is that the product line is pretty well known. Because the company produced annual catalogs for many years, collectors can be reasonably sure of what they’re looking at, when it was made, the variations, and so on.” To ensure that the project is a powerful research tool for collectors and educators alike, it is fully searchable, designed with both access and ease-of-use in mind. At this time, Niederman and Zahorcak are personally producing the DVDs, each of which contains high-resolution PDFs of each catalog. The DVD is available upon request, essentially for the cost of the disc and shipping. And the compensation for all their hard work? That’s their gift back to the camera-collecting community. For more information, visit Niederman’s website at antiquewoodcameras.com, or contact the project authors at digitized.kcp@gmail.com. Well done Robin, congratulations…..well deserved! Amelia Mary Earhart purchased several Kodak 620 DUO cameras, and George Putnam, Jr. at least one for her in 1937. Is there any way to trace these by serial number (other than that last one which was inventoried by US Army in Long Beach, CA)?